PBCFs are an energy saving device (ESD) that can enhance propeller efficiency, thus requiring less power to propel the vessel forward at a certain speed. 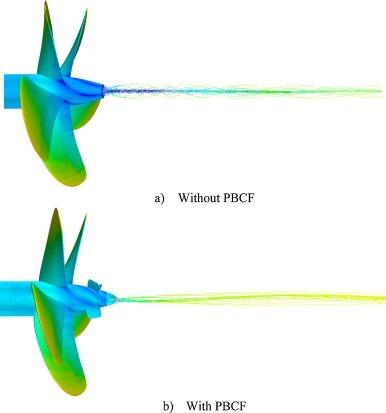 The primary function of PBCF is to improve the propeller performance characteristics. This is done e.g. by minimizing the hub vortex and the resulting rudder cavitation. There is an impressive research project from the University of Strathclyde on this topic where a novel full scale PBCF design optimization approach was investigated. In this work, CAESES® was used to control the entire optimization process, to integrate STAR-CCM+, as well as to automatically generate new geometries from a parametric PBCF model. The various geometric design candidates were run in uniform flow condition using Reynolds-Averaged Navier-Stokes (RANS) equations to simulate open water tests. With this analysis, one can predict the ESD impact on the propulsive efficiency. Finally, the overall idea is to find the global optimum of PBCF designs. If you are interested in this topic, we can highly recommend to go through this interesting and detailed paper. 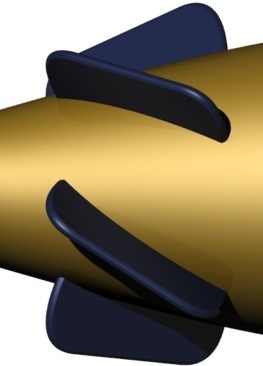 Thanks to Kurt Mizzi from the University of Strathclyde for providing this material 🙂 Kurt is one of the authors of the work “Design Optimisation of Propeller Boss Cap Fins for Enhanced Propeller Performance”.